Easypromos offers integration with lots of different applications, to make it easier to manage your promotions. For example, you can integrate an Easypromos photo or video contest with Dropbox, to save and download competition entries. Note: This integration is available as an extension for Premium and White Label users. Activate Dropbox integration for $49 USD/€49. When you create a Photo Contest or Video Contest, users will share their competition entries via the registration form. So all you need to do is set up Dropbox integration with the registration form. 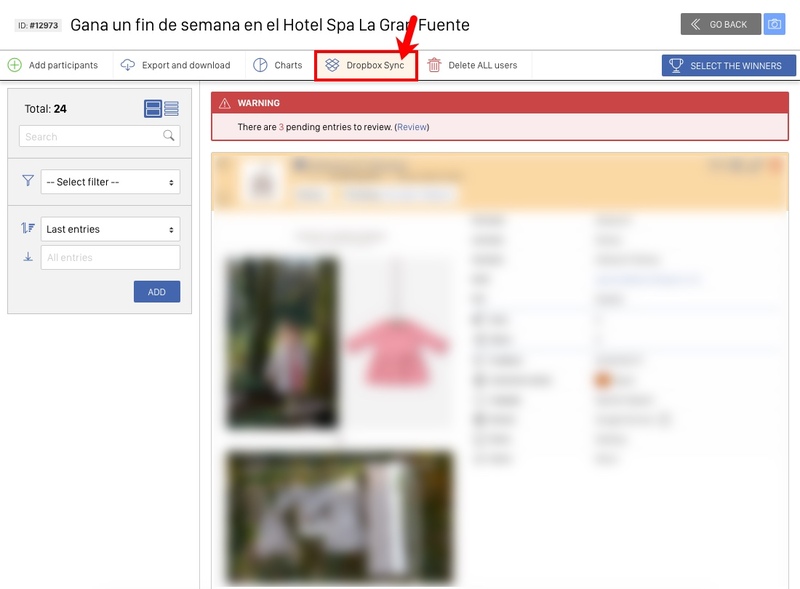 If this is the first time that you have logged into Dropbox with Easypromos, you will be asked to accept some permissions. You must accept these if you want to integrate Dropbox with your photo or video contest. 4. The Editor will display a green box, with the message Dropbox account connected successfully. Click Save uploaded pictures in Dropbox. Every time users upload a competition photo, it will automatically be saved to your Dropbox account. For videos, click Save uploaded videos in Dropbox. You'll be charged for the extension when you activate your contest, and users start to upload their files. All the files that users upload will be collected in a single Dropbox folder. Sign in to your Dropbox account, and you'll see a folder named Easypromos, followed by the promotion ID number. Use Dropbox’s own tools to download the material to your computer or alternative storage device. Type the new name of the folder and click Save. Note: we recommend renaming the folder before the contest starts. It's easier to change the name before the folder contains any competition entries. If your contest has already started, and you have already collected photos and videos, it's still not too late to activate the Dropbox extension. 2. Click Add Extension. You'll be taken to the payment screen to activate the extension. 3. The extension will then appear as active on the Integrations page. Click Connect with Dropbox to link your account to the promotion. If you want to rename the Dropbox folder where competition entries will be saved, you can do that on the Integrations page. 4. To start importing original videos and images to your Dropbox account, go to Participants on the promotion management page. A pop-up window will ask you to confirm that you want to synchronize files with Dropbox. Start the process by clicking Sync Now. You'll receive confirmation with a pop-up, and an email when the sync is complete. 5. From now on, whenever a video or photo is uploaded, it will be stored directly on your Dropbox account. How can I download the videos uploaded by the participants?